Keiko Yamada Fosterling was born in the city of Niigata, which is in Niigata Prefecture in the western part of Honshu. She still lives there. She loves to travel. Her favorite places are Morocco and San Francisco (and Japan, of course!). She spent a year in San Francisco when she was 20 and 21. That city deeply fascinated her because of its cultural offerings, such as music and the arts. As you may have guessed, she is crazy about music. She enjoys inviting her favorite bands to Niigata from Aichi Prefecture, where many of them are getting going. She currently works at a restaurant. She met Eve while working at a different restaurant when Eve was traveling in Japan. 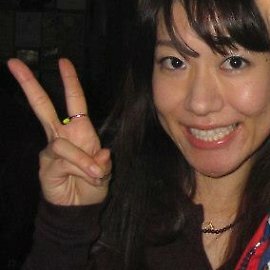 Keiko is also trying to start her own business, teaching English to people in Japan. She would like to show them how English is far more interesting than they imagine. Furthermore, she wants them to see that by studying English, they can solidify their understanding of what it is to be Japanese. Through this venture she hopes to make her students smile because that will make her happy, which will in turn make others smile. Nothing spreads as fast as a smile! Her favorite kanji is 愛, which means "love." She thinks that every person is filled with love but that people often forget this truth. When they are aware of being loved or of loving, it fills their soul and produces more smiles!